We can move more easily (esp w/ Mars recently direct) and see more clearly now (since last week’s cleansing Pisces Moon). We begin to feel the early stages of the shift in seasons (Equinox not far away). The call to sift the wheat from the chaff, re-organize, and re-orient for the shifting is strong (Virgo Sun). Earthy energy helps keeps us grounded (5 planets in Earth signs) as we move through the shifting. Waning Moon asks us to prepare to move inward for deep reflection. 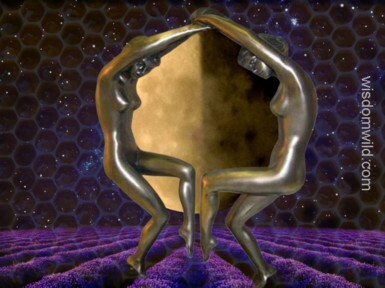 Half-lit in Gemini we are pulled towards new ways of finding balance. To reach and stretch and stay grounded and connected to loved ones. Sun and Moon together push us to be practical and grounded in our bodies, our work, and with the land (Virgo Sun); and to embrace the freedom to change whatever helps open the ways to creative well-being (Moon in Gemini). The key to this time is presence. Yes, it is a time to let go, clear out, cut loose. Yes, there may be a strong call to ‘get busy’ (Virgo Sun), but this must be balanced with pause, rest, and space for creating (waning Moon). Both pursuits bring rewards. Use this waning time to prepare and plan for projects you have in mind. Ground the dreams you dance in the starry skies. Rest and nourish in the deepening dark.